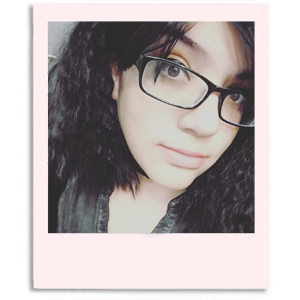 Hi everyone. I had the day off work, like I predicted I would because of the snow storm. Unfortunately not as much nail stuff as I would of liked. I ended up falling asleep mid swatch session, haha. The last swatch of the night had me dreaming the sweetest of dreams though. You guys know the one, everyone knows it. 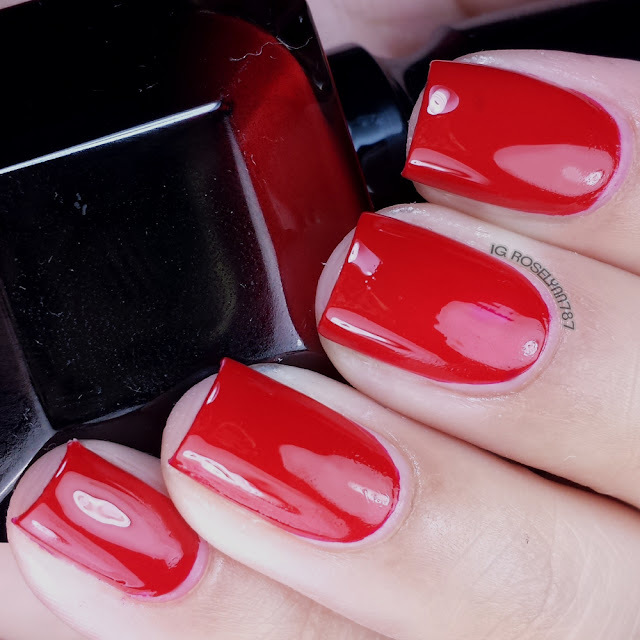 That's right, the polish that needs no introduction... Rouge Louboutin by Christian Louboutin. Someone cue the angels singing please. It honestly feels really surreal to be able to own this polish. My best friend Adam gifted this to me for Christmas and I practically cried. I wish I had enough space and better angles to capture the whole bottle. I'm sure most of you fellow polish addicts have seen it though. This is truly luxury at its finest moment. Honestly, I'm a girl living pay check to pay check and would never be able to give myself this. That's why it was so shocking to receive this! Turns out though, that my husband and best friend decided they will gift me one on special occasions from now on. I'm certainly not going to argue with that! 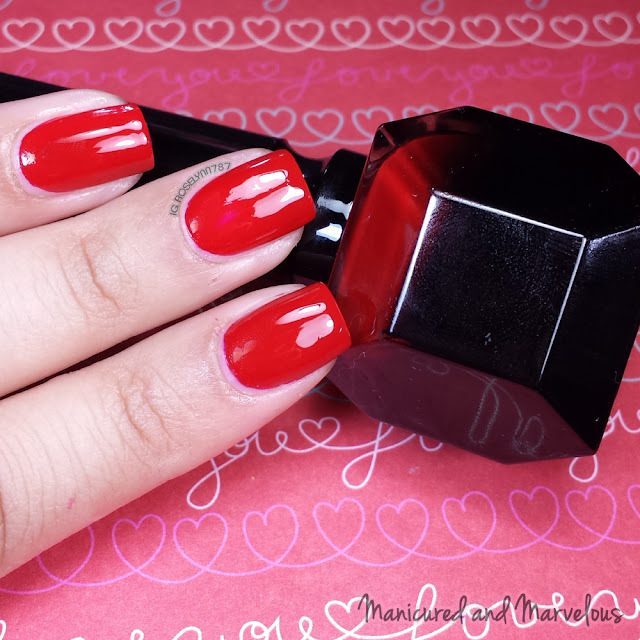 Rouge Louboutin by Christian Louboutin is a creamy classic red polish. I was hesitate to believe the hype, but let me simply say the hype is real. It's a one coater with a glossy natural finish. Top notch excellent formula, consistency, and dry time. I'm also glad to report no staining. I ended up using two thin coats for a fuller finish and sealing it with Seche Vite top coat. While it's hard to justify the price tag, you're at least receiving a polish of very high quality. But the price tag is more than just the quality, you're paying for the lux or 'brand prestige' if you will. As for this small town girl, I'm perfectly a-okay with getting one a year and never owning the full collections. It's simply not for everyone and I'm sure there are plenty of close dupes. 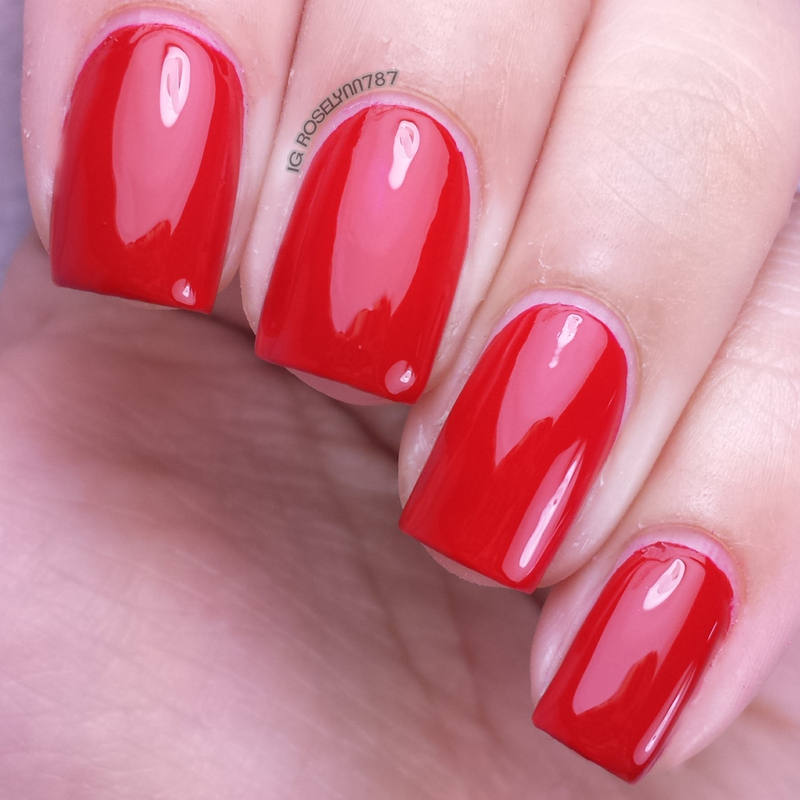 For this particular one, I can't help but think of OPI's Race Red. For those fellow Pretty Little Liar fans, can you picture A wearing this? Yeah, I definitely can. That's exactly why I had to rock this out for tonight's brand new episode. As always, be sure to check out the other ladies participating in this weeks Red Coat Tuesday! And if you're wearing something red, don't hesitate to join us. 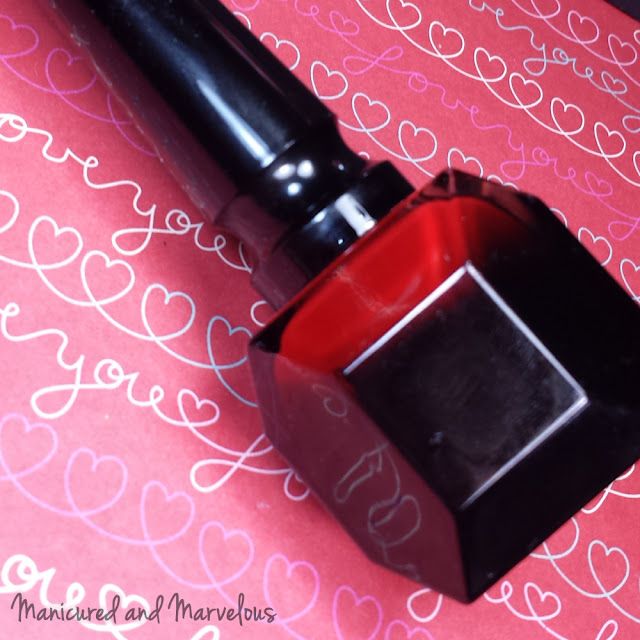 Before you go though, be sure to let me know what you think of the lush Rouge Louboutin. Do you own any? Do you own of the other colors? Droooool. What a gorgeous red! I agree! It's very luscious and so bright *more drooooool* haha. It looks beauuuutiful on you! Thank you! Red has always been my fave color on my nails. The definition of the perfect red, haha. This is an awesome red! Love the shine! It truly is the perfect red. And the shine is just as incredible even without topcoat! It's definitely now my most prized possession :) Even if I never get another again I'm happy haha. Ooooo. I doubt I'll ever get any of these, lucky girl! This is like my new favorite red. I did the first Red Coat Tuesday post of the year with it. It looks gorgeous on you!